The Boston Ballet is often overlooked when my friends make plans to go out, and I thought by sharing a conversation I had with John Lam, a Boston Ballet Soloist, it might help raise awareness and encourage people to support this amazing cultural institution in Boston. Last Friday I sat down with John on the top floor of the Boston Ballet in the South End. Watching dancers lounge and chat after a long day of rehearsals was surreal, and I asked John how one ends up with a career as a ballet dancer. John’s story surprised me. His parents emigrated to Northern California in the 1980s as refugees from Vietnam, and enrolled him in ballet through an inner city scholarship program when he was 4. His parents who were of humble origins enrolled him not out of a love for dance, but because they needed him to be watched after while they worked their multiple jobs. His passion for dance and ballet in particular manifest years later. As a teenager, while dancing in Marin County he met Mikko Nissinen; years later Mikko would become the Artistic Director for the Boston Ballet and recruit John. When talking about The Boston Ballet 2012-2013 season, John talks with admiration about their amazing range in shows. Next Thursday I will be at opening night to watch the Fall Program, and I’m looking forward to seeing more of that range. Tickets start at $29 (less if you are a student). For more about this year’s season visit here . @Anonymous thanks for your comment and we loved that this year’s SYTYCD winners with both classically trained ballet dancers. We have several performances this season that take a more “modern” approach to ballet. For example, Fall Program includes the return of two cutting edge contemporary favorites – Christopher Bruce’s Rooster set to music by The Rolling Stones, and The Second Detail, an electrifying piece by William Forsythe as well as a world premiere by our resident choreographer, Jorma Elo. The last time I saw a ballet was my sister’s school recital. I do like the TV dance show SYTYCD. If they had more modern dances I think I’d be more interested. How could you just “sit down” with John….!!! He is so exciting to watch dance, walk, slouch…anything! He has been one of my favorites since I started going to BB 3 years ago. 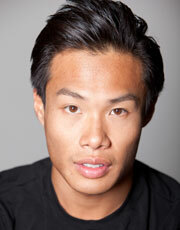 With the departure of james Whiteside to NYC, I hope Lam gets more major roles. PS: I have a poster of John from two years ago whereon he was the featured dancer for their ads. Be still my heart! Were John to skate, he would melt the ice!